Newsletters from 1955 to 1958 can now be viewed on the Gallery and Archive Page, please check the page regularly for further additions. 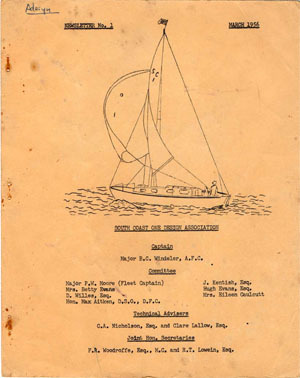 The SCOD Association archivist, Peter Shaw, has made available his collection of past newsletters to be digitised and made available on this site. Newsletter no.1, dating from 1956, appears here and the others will follow in the next few days. Apologies to those who may find the download rather large, hopefully this will be addressed in the subsequent ones. The collection covers the first five newsletters in the fifties (nos 1-5), one from 1961 (unnumbered) and then the majority covering 20 years from 1978 to 1998, curiously starting from issue 1 again (it is difficult to believe there were none in the intervening years - does anyone have copies of these?). They are a fascinating insight into the history of the class which will be of huge interest to present owners. The Spring Rally will be held at Lymington (50°.75N 1.55°W) on the weekend of 28th/29th April (HW on the 28th 16:22, 2.6m, HW on 29th 17:26pm, 2.6m). Please contact Louise (socialsec@scod.org) as soon as you are able if you are interested in attending so she can book the moorings and if you are attending without a boat, the pub.